Ibérico de Bellota Fresh Secreto Cut Pork for sale. Buy online at Zingerman's Mail Order. Gourmet Gifts. Food Gifts. The secreto is a coveted shoulder cut prized in Spain and Portugal. It’s incredibly rich and beefy, like the pork version of a ribeye steak. We have a limited supply from Spain’s Ibérico hogs, the black footed pigs of Southern Spain, the ones who roam wide in the Dehesa, foraging, rooting—and in this case, eating kilos of acorns (bellotas)—and turning their loins and hams into the most prized cured meats in the world. In fact 99% of the time you find the pork cured, not fresh ready to roast or grill. Lucky us. 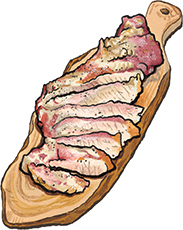 Each fresh, raw secreto comes marbled with the bellota-fed fat that melts in your mouth in a way that’s almost surreal. Exceptional. Boneless. Ships frozen, arrives frozen or cool.